Such is Nintendo Switch’s popularity as a platform, that within two years of its launch we have no less than three motocross and supercross-related games. 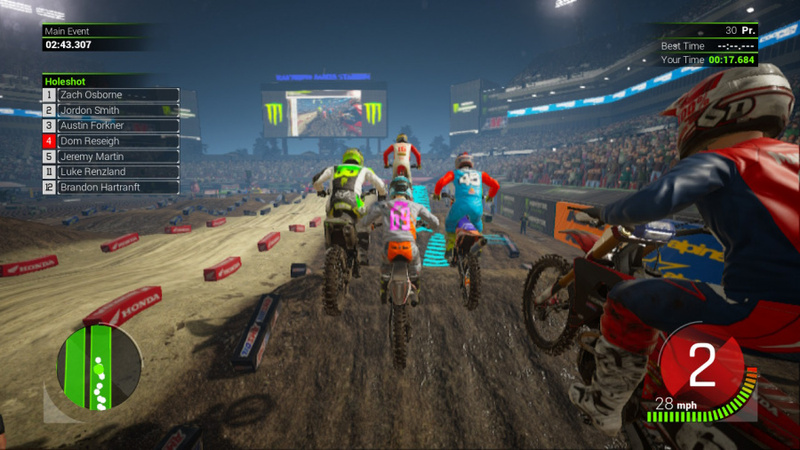 For such a niche corner of the racing simulation genre, the world of two-wheeled mud shenanigans has been scoring holeshots and podium finishes on handhelds for quite some time. 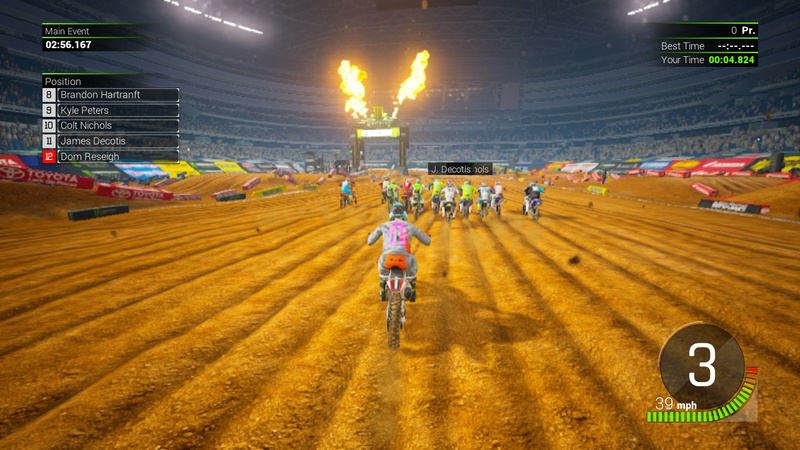 However, the last outing – Monster Energy Supercross - The Official Videogame – stalled right out of the gate with some missing modes and a noticeable visual downgrade. Longtime developer Milestone has clearly taken this feedback on board with Monster Energy Supercross - The Official Videogame 2 and attempted to provide a Switch port that offers a little more parity with those versions releasing on other consoles. This time you’re getting access to the Track Editor mode that was cut from the previous instalment in the series, along with full support for online multiplayer and the addition of the new sandbox 'Compound' mode. 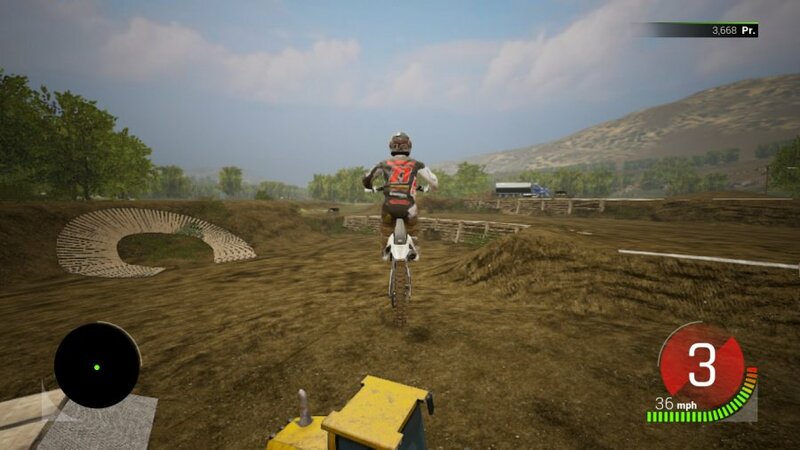 So if you’re a supercross fan with a love for Switch, you can rest assured you’re getting a far more complete package this time around (including, unsurprisingly, a few concessions as well). The aforementioned Compound is one of Supercross 2’s best new features, even if it’s one that’s not quite fully-realised yet. This sandbox area offers a place to practice the finer points of the game’s mechanics. While its looks might be a little rough around the edges, its physics are just as on-point as ever. If you want to know how to nail the rhythm needed to ride whoops correctly, how best to lean into a turn without throwing your rider off, and the cleanest way to land after a long jump, this is the place to do it. You can unlock more of these areas – and items to customise them with – by completing challenges in Career mode and time trials, giving you plenty of reason to try out other modes. It’s a shame this couldn’t have been utilised as something of a social space, where players could meet up and practice tricks and take part in ad-hoc races. There’s just so much potential here, and while the Compound isn’t quite the finished article yet, hopefully Milestone will iterate on it in the right way in future MXGP/Supercross titles. Still, with the robust Track Editor included this time around – which enables you to build your own circuits from scratch and upload them online for others to play – there’s a lot here to keep you occupied. The overall presentation is also much stronger this time around, with an extra effort to recreate the energy drink-fuelled machismo theatre of a real supercross event. Having commentators Ralph Sheheen and Jeff Emig on-board adds to the authenticity (even if their delivery is a little stiff and limited only to pre- and post-race cutscenes) and with plenty of real-life courses from the current pro circuit, ardent fans will be grinning with glee. Sure, it’s not a touch on F1 2019 or other big-budget racers when it comes to presentation, but if you’ve played the series before, you’ll know it’s a small step in the right direction. On Switch, performance is mixed between docked and handheld modes. Frame rates for both sit around the 30fps mark (with the latter dipping into the high 20s every so often) with only the occasional bit of chug when playing on the go. Graphics are surprisingly decent when playing in docked mode – the lighting model is more dynamic and texture detail (such as the sheen and slickness of mud) really stands out. Some of these details are still present in handheld, but with a noticeable dip in graphical fidelity. 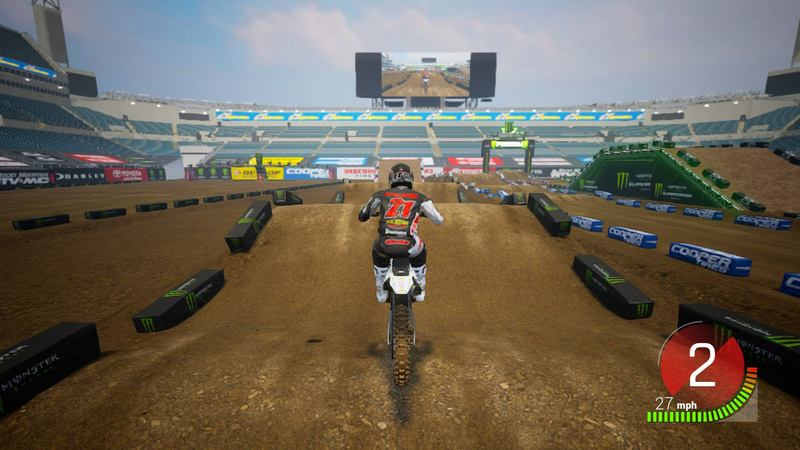 For all its improvements when it comes to feature parity, Supercross 2 does retain some technical and mechanical issues Milestone really should have addressed by now. Loading times are still painfully long, with minutes going by as you stare at a green loading bar that fills at a rate so slow you’ll start thinking the game is outright taunting you. This isn’t just a Switch problem either – prolonged loading times have dogged the other console versions as well, so you’ll have to learn to kill time regardless of where you choose to play. Oddly, of all modes, the track editor is by far the fastest for loading times. There’s also way too much of a grind involved in unlocking cosmetic items for your rider. Despite having found a steady pace of doling out in-game credits in the MXGP series (see MXGP 3 on Switch for an example of this), the Italian studio has made the bizarre decision to gate off even the smallest of items behind grossly-inflated prices. There are no microtransactions here, so you’ll have to grind through multiple careers to earn enough to get your hands on the good stuff. It’s something Milestone could patch in a future update, but it’s still an odd choice to include. Wow wasn't even expecting it to be ok let alone to be good. Did somebody say... "F1 2019"? Pleasepleasepleasepleasepleasepleaseplease. Are the screenshots in this article stock images or have they been taken from Switch gameplay? My guess is stock, and not from Switch gameplay, but happy to be corrected. @beazlen1 Yeah, sucky load times are a killer at the best of times, but they're so totally not in-keeping with what the Switch is about, that it would really hurt the Switch experience of this game for me. Glad the game is solid though. If the gameplay is fun and fairly smooth, then the loading times won’t bother me as much. The gameplay is my main concern. Glad to hear it’s a nice improvement over the first. So not a shovelware? Yeah I'll see if I could find this in the bargain bin someday. Watched some gameplay on Youtube. Defintiely looks like the best MX game the Switch has seen by quite a margin. I’m certainly interested, but I’ll probably wait for it to go on sale. 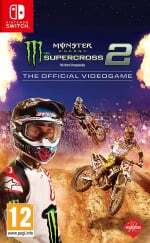 ... Monster Loading Supercross - The Official Videogame 2. Combined sale barely made it to #38. This will be in the bargain bin in no time. Dirt Rally 2.0 is 2 weeks away. $60 better spent right now. @Agramonte whilst I have no doubts DR 2 will be a great game... its not been announced for switch? @nicols So completely misleading from NintendoLife then.......or they have a duff console. Thanks for reviewing this one! Glad it turned out to be a decent port for a change, after a series of duds they finally delivered. @Agramonte I think that's because everyone who would have bought this game was waiting to see how it turned out. After the first Monster Energy Supercross game turned out to be an awful port I don't think anyone was willing to take the risk with this title. I know I wasn't, I love these kind of games but I waited for a review for a good reason. Now that I know it's good I will definitely be picking it up. @nicols no, not yet. But we getting GRID. @Agramonte That's slightly different though - its a conversion of a popular existing mobile port by Feral Interactive so its already optimised for handheld, lower power consoles / tablets - whereas DIRT 2.0's in house development is targeting high end consoles / PCs. On the plus side, Feral did do a great job of it apparently on phones so it bodes well for the Switch version. If you compare MESX2 to other consoles it is just an average to above average racer in a sea of racing games... but on Switch its an above average port of an above average racer when there is a real lack of decent (realistic) racers available for handheld players. Most shoot for a solid 60 fps, hell a lot really want more especially for Sim racing or a flight game but really, sometimes it struggles at 20 ?? So you just couldn't wait to poop that out and not just try to make it a little better first ? Beta at best again..
@TTgowings I have the one they released last year and honestly, I thought the frame rate was pretty decent. I actually liked the game as it was. The in-between race animation were hideous, but the racing itself looked pretty good. Last year's installment of this game got ripped apart in the reviews and yes, they did leave out multiplayer and the track editor, but if you like single player, it was good. Personally, I'm fine with single player because my experience with racing games is I get killed in multiplayer or, on Switch, there's just no one on-line. I don't think it takes too much grinding to get gear, unless you for some reason want ALL the gear. @TheFox I appreciate the info, will definitely be waiting for updates/patches and a huge discount before taking the leap, currently awaiting my release of V-Rally in the US.